People with diabetes are more susceptible to a number of skin conditions because of the complications of high blood sugar. Early diagnosis and treatment can prevent further complications. In addition, diabetics have to how learn to care for and protect their skin to prevent some of these conditions from occurring. Diabetics are prone to a number of skin problems that result from poorly-controlled blood sugar, nerve or blood vessel damage that decreases blood flow and cause wounds to heal slower, or from other underlying factors that are not yet understood. Some of the skin conditions can develop before someone is diagnosed with diabetes and may alert a doctor to the possibility of the diagnosis. People with diabetes have to always be alert for skin problems such as infections and wounds that, if not treated properly treated, can lead to more difficult-to-manage complications. The most important strategy in prevention and treatment is to keep blood sugar in the normal range. With proper, preventive diabetic education, skin care, and early treatment of infections there are fewer severe complications. Diabetics are prone to itchy, bumpy patches of fungal infection most frequently caused by Candida albicans (yeast). Infection tends to be recurrent and can cause severe itching with breakdown of skin from scratching. Open skin is then susceptible to bacterial overgrowth and infection. In men this is commonly known as jock itch. In women, yeast often causes recurrent vulvar and vaginal infections that are sometimes resistant to treatment. Ringworm is another fungal infection that diabetics may experience. It manifests as a defined ring on affected areas and can occur anywhere on the skin. Treatment includes an antifungal cream twice a day and keeping the area dry. A light sprinkling of cornstarch can help to keep affected areas dry. If the infection is severe, prescription oral anti-fungals might be needed. Diabetic dermopathy consists of small, light brown, round or oval patches, usually on the front of the legs (shin spots). They occur because of narrowing the small blood vessels (atherosclerosis) that bring blood to the skin, a complication of diabetes. This causes poor blood supply to the skin, especially in the legs, and can also cause of other skin conditions. No treatment is needed besides controlling blood sugar. Digital sclerosis is a tightening and thickening of the skin on the backs of the hands of diabetics. The skin takes on a waxy appearance. The finger joints become tight and difficult to bend. It can also affect the forehead, elbows, knees, toes and ankles. This is a common condition, affecting about 30% of diabetics. It is often seen in children with childhood diabetes. Controlling the blood sugar can improve the condition. Using moisturizers can relieve skin tightness. Scleredema diabeticorum is a thickening of the skin, usually occurring on the neck and upper back. The skin becomes stiff and tight, as in digital sclerosis. It is more common in diabetics who are overweight and whose blood sugar is not well-controlled. Keeping the blood sugar in a normal range will stop the condition from progressing. Moisturizing the skin can give some relief to the tightness. The necrobiosis lipodica of diabetes is a less common condition. Like diabetic dermopathy, it is also caused by narrowing in the small blood vessels. The affected skin gets raised, reddish patches that later become thin and shiny, with visible blood vessels underneath and a purplish or reddish border around them. Thinning of the skin is thought to be due to loss of collagen. No treatment is needed, but if the thin surface opens, the areas need to be treated by a doctor before they get infected. Bullosis diabeticorum is also less common. Blisters appear usually on the backs of hands, fingers, feet and toes, though they can occur on the legs and arms. Blisters can be large and look like those caused by burns. They usually heal without treatment, especially when high blood sugar levels are treated. Euruptive Xanthomas look like yellowish, pea-sized bumps just under the skin and are fat deposits. They occur because of high fat (triglyceride) levels in the blood because of poorly-controlled diabetes. They are more frequently seen on the backs of the arms, legs, hands, feet, and on the buttocks. They resolve without treatment when the high blood sugar is kept under control. A doctor will also prescribe medicines to lower the triglyceride level. Acanthosis Nigricans (AN) is a darkening and thickening of affected skin, most frequently occurring on the sides and back of the neck, under the arms, in the groin, and in skin folds such as under the breasts. The skin can look velvety and warty. It is more common in diabetics who are very overweight. This benign condition is sometimes seen before diagnosing diabetes. The theory is that this condition may be caused by the higher insulin levels produced by insulin-resistant diabetics. It also occurs in other conditions of insulin resistance, such as polycystic ovarian syndrome and HAIR-ANs (hyperandrogenism, insulin resistance and acanthosis nigricans) syndrome. There is no treatment for AN but weight loss can decrease the insulin resistance and bring insulin levels down. Disseminated granuloma annulare lesions are raised, ring or crescent-shaped, red or reddish-brown areas scattered usually on distal skin such as the ears and fingers, hands, feet, and sometimes on the chest. Sometimes prescription steroid medicines can clear up the condition. Besides yeast, diabetics are prone to itchy areas of skin, more commonly in the lower legs. This happens because high blood sugar and poor blood flow from the narrowing of the small blood vessels can cause skin dryness. The skin can become cracked, especially the feet, and cracks can get infected. Bathing or showering using warm rather than hot water, use of mild soaps, and moisturizing the skin can help to decrease symptoms. Vitiligo is not caused by diabetes, but is a common condition in diabetics. Skin cells that make melanin pigment are lost and patches of skin become lighter. It affects skin on the face and abdomen more frequently. No treatment can reverse vitiligo patches. Wearing sunscreen can protect the affected areas. 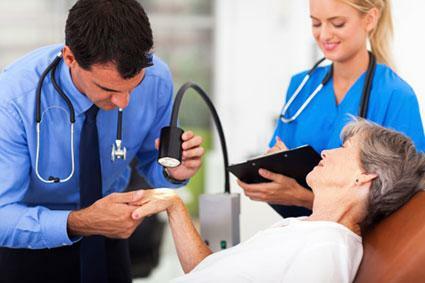 Peripheral neuropathy occurs because high blood sugar causes damage to nerves, particularly in the hands and feet. This is not a direct skin condition, but it causes diabetics to have decreased feeling in their skin. Because of the poor sensation, undetected sores on the hands and feet can develop from burns, extreme cold, or pressure. Diabetics have to be especially careful to wear well-fitting shoes and check for objects in their shoes to avoid pressure sores that can cause non-healing, deep foot ulcers. Insulin made from beef or pork can cause skin reactions at the site of injections. Reactions at the injection site include, allergies, lumps, keloids, thinning of fat, and skin darkening. Impurities in the insulin may increase the risk of these reactions. Switching to a purer or non-animal form of insulin is the treatment for allergic reactions. In addition, changing injection sites frequently can decrease chances of developing other skin complications. Abnormal blood sugar levels paired with narrowing and blockage of capillaries can cause slower healing of wounds in diabetics. Slow-healing wounds are also more likely to get infected. This is a greater problem in people who are obese and those whose blood sugar is poorly controlled. Diabetics have to pay special attention to wound care, especially after having a major surgery that leaves a big incision to heal. Surgeons usually leave sutures in diabetics longer to allow the skin more time to heal. Check your skin daily, including hands and feet, for dryness, cuts, sores, bumps, scrapes, cracks, blisters, bruises, dark spots, or redness. See your doctor early if anything concerns you and before any problems worsen, especially non-healing ulcers that get wider and deeper or are accompanied by pain or fever. Protect your skin, hands and feet from extreme hot or cold temperatures. Wear thick gloves and socks and other protective clothing when in the cold to avoid frostbite and blisters. Be careful when you are cooking to avoid burns that may heal slowly and get infected. Take warm (not hot) baths or showers to avoid drying or burning the skin. Use mild soaps that don't contain strong detergents, as they can dry the skin or cause allergic reactions that lead to scratching followed by cuts. Keep skin moisturized to prevent dryness that can lead to cracks, blisters, and sores. Avoid applying too much lotion to areas that stay moist, including between fingers and toes. This helps avoid encouraging fungal growth. Drink enough fluids to keep your skin hydrated, especially because people with diabetes tend to urinate a lot. Keep areas that tend to perspire dry, such as under the breasts, armpits, groin, and genital area. You can apply a dusting of cornstarch to these areas to help keep them dry. Avoid scratching itchy areas or picking at bumps or sores to prevent progression to infection and further complications. Clean and treat open areas of skin quickly with an antibiotic cream to decrease the risk of infection. Wear wide, soft, comfortable shoes. Check inside your shoes for pebbles or other objects before wearing to avoid cuts and pressure sores. Diabetics need to see a doctor quickly if a sore, a bump or a wound is not healing, or is getting worse after treating at home for two or three days. In addition if new spots, discolorations, or blisters appear on the skin see your doctor for early diagnosis and possible treatment.